While I was at my Mum's recently, I spied this inside her holiday make up bag. I swatched it, and I fell in love! She had bought it the previous year to use on her holiday, and was about to take it with her again. . Lucky for me, when she got home and she hadn't use it for the whole two weeks, she said that I could have it. She said it was a bit shimmery for her. This is a Rimmel Glam Eyes Mono Eyeshadow, and I think you can still by them in Boots/Superdrug, but I can't be sure. 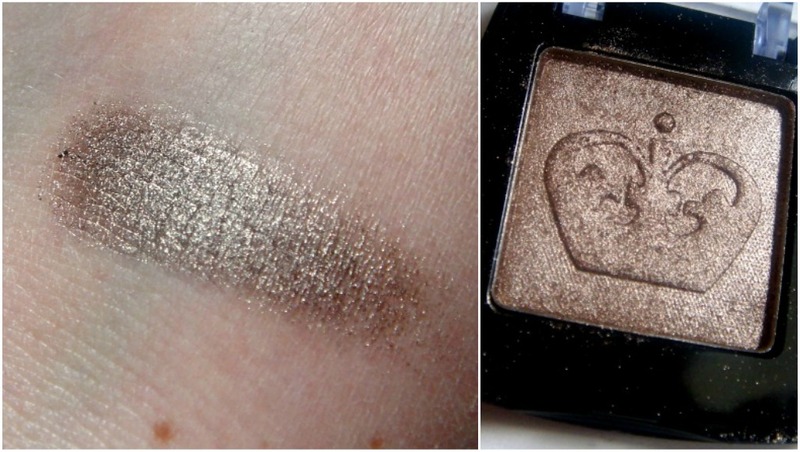 It is one of the most luscious eyeshadows ever. It is so, so smooth, the pigmentation is strong and the colour is a stunning golden/bronzey taupe. It looks great alone, or paired with a dark brown in the crease (Fotd soon). It's funny, because I used to hate browns, golds, and bronze eyeshadows, thinking they were boring, but as I've matured, I love them just as much as I love bright shades now. There is nothing like a sophisticated smoky eye with these kind of shades. I've googled it, and it seems you can get this colour here, for £1.25, which makes me think it might be discontinued in Boots, etc. If you like these kind of colours, I would recommend! This eyeshadow looks so pretty!thanks for sharing hun.I love the co our! !